We make our own brackets and rings as well as using our own finishes. 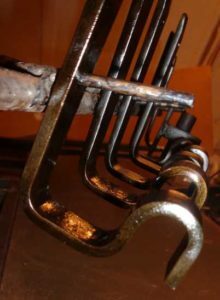 Just as we make all our curtain poles, so the rings and brackets are all made in our workshop too. If you require brackets with a particular projection or a variation, just let us know. There are several types of brackets for different situations. is made from 16 x 5 mm strap and projects the pole 45mm being the gap between the wall and pole (or 53mm from wall to pole centre). The bracket is 115mm from bottom to top. The 5mm diameter screwholes are centred 20mm and 65mm frrom the bottom of the bracket. 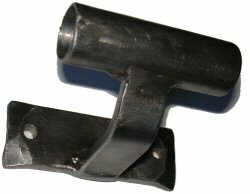 The Centre Support Bracket… can also be used as an alternative to the Standard Bracket where space is limited. 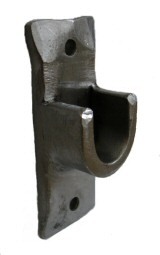 The Joining Bracket… used to join bay window curtain pole halves and longer poles which are in sections. Shown here with a 25mm high fixing plate. 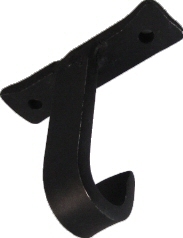 Integral Support Bracket… used with bay window and extra long poles to allow “passing” rings to travel over them. 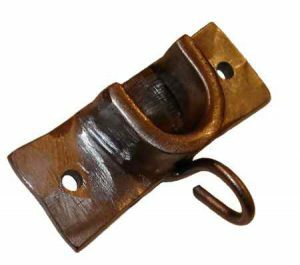 Recess Brackets… for use with Recess poles e.g. opposing walls in recesses. Vertical Recess bracket (without capture ring). Ceiling Brackets… available for straight or Bay window curtain poles. The gap between the pole and the ceiling can be specified as some finials are larger than others. Ceiling brackets for Passing rings are also available. 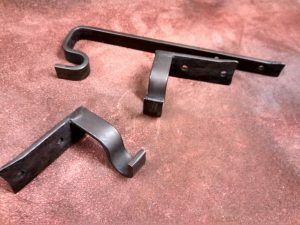 Custom Brackets…special brackets for unusual or awkward situations. 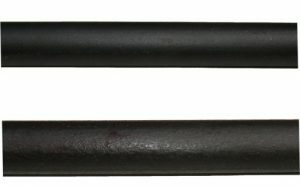 There are two types, “Double hoop” and “Passing” of which 4 per 30cm are supplied with each 16mm diameter pole. Double Hoop…These are made from two pieces of drawn steel, 4mm dia steel for the larger ring, 3mm for the smaller. Each is hand assembled from saw cut steel. This gives a very close join and smooth action. 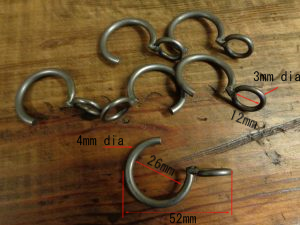 The distance from the top of the pole to the inside bottom of the small ring is approx 38mm. 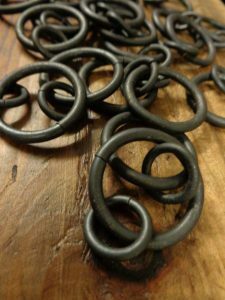 Passing rings…These are individually fabricated from the larger and smaller rings and have a quarter cut out of the main ring so that they can pass over the integral bracket. The distance from the top of the pole to the bottom inside of the small ring is approx 44mm. Note: Rings for curtain poles, especially Passing rings, must be attached to hooks inserted at the top of the curtain header tape. Click here for more info. Various people claim to have invented Passing rings but it is a system that has been used with curtain poles at least since Victorian times! Beeswax…Applied directly to the solid bar, this gives a mellow, very dark rustic brown. We use our own recipe and method of applying this to give our poles a unique look (and aroma!). This is a very popular finish. 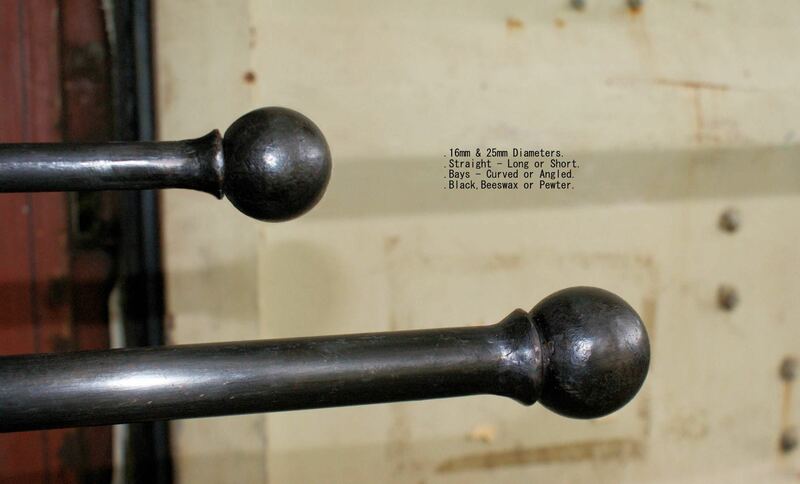 Traditional Black…This is our-own-mix paint finish which is useful where existing black ironwork needs to be matched. The paint is hand-waxed afterwards.